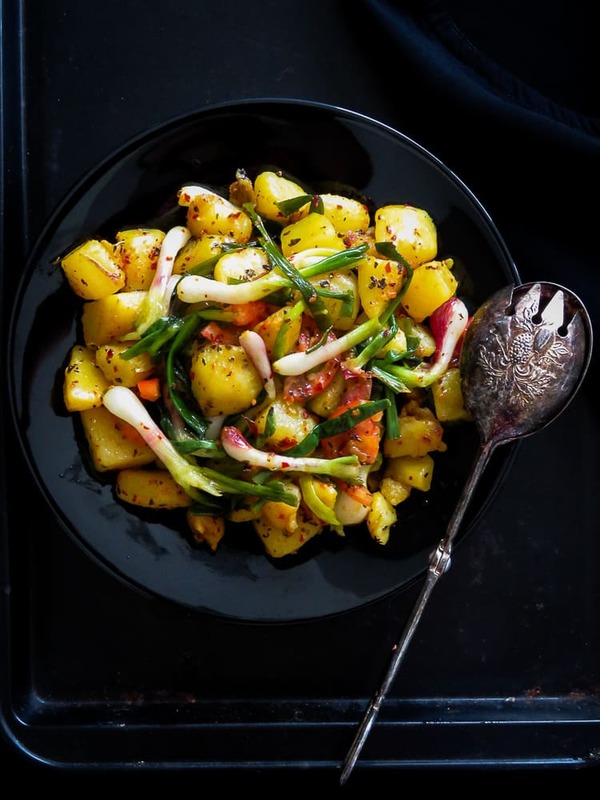 Potato, spring Onion Basil chilli stir-fry, give yourself 30 minutes to create a burst of color on your table with this easy side dish. Gluten-free, vegan, vegetarian, low-carb, 30 minute. 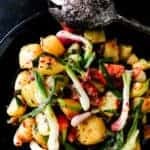 In the spirit of celebrating everything Summer and one pan skillet dishes this Potato, spring Onion Basil chilli stir-fry will complement any main meals you serve. 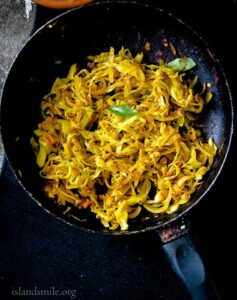 I’m big on keeping things simple when the need arises, especially enticing dishes like the one you see above, my seasoning for this stir-fry runs only to three, they are Salt, Basil and chilli flecks, you can add a dash of lime if you want to. But the seasoning must be just right to complement the vegetables in the dish. While my kids can’t do without meat to jazz up their meals, I usually skip it two or three times a week, which makes this stir-fry a great option for me. I like to serve myself a bowl of rice with a good portion of the above making it perfect for a simple meatless meal option. Things to keep in mind when making the following stir-fry. I decided to give you two options to cook the Potatoes and cover all details of getting it done right the first time. The reason for this being that if the Potatoes are not cooked through you might have a dish NOT worth talking about, trust me on this, the kids were brutal in their opinion the first time I made it. So make sure to get the Potatoes done whichever method you use to cook it. 1/ Two ways to prepare the Potatoes for this recipe – It’s very important that the Potatoes are cooked through. There are two ways to make sure of this. Say that you’ve cut the Potatoes into large cubes and you are in doubt if they are cooked through then par boil them before cooking as per the recipe. or you can cut them into smaller cubes and fry them for 10-15 minutes over medium heat. 2/ wilting the Spring Onions should be done 2-3 minutes before removing the pan from fire, making sure there’s still a crunch at the end. Recipe- Potato, spring Onion Basil chilli stir-fry. Clean and cube Potatoes, decide how you would like to cook them, par boil if the Potatoes are cut large or fry if the Potatoes are cut into smaller size. Place a non-stick pan over medium heat and pour in the oil. if the Potatoes are boiled, add it to the pan. if you are semi-frying the Potatoes, cook and fry it for 10-15 minutes . Once you’ve prepared the Potatoes the way you like, add the Turmeric, Tomatoes, Salt to season and cook for 5-10 minutes over medium heat until the Tomatoes become soft and the Potatoes are cooked through. Include the Spring Onions to the pan cook for 1-2 minutes until they wilt. Just a minute before removing the dish from the fire, sprinkle the dried Basil, toss for a minute, season with Salt if needed. you can squeeze a bit of lime if you want to. Serve over a bowl of rice or as a side-dish to any meat you like. 1/ Clean and cube Potatoes, decide how you would like to cook them, par boil if the Potatoes are cut large or fry if the Potatoes are cut into smaller size. 2/ Place a non-stick pan over medium heat and pour in the oil. 3/ if the Potatoes are boiled, add it to the pan. if you are semi-frying the Potatoes, cook and fry it for 10-15 minutes . 4/ Once you’ve prepared the Potatoes the way you like, add the Turmeric, Tomatoes, Salt to season and cook for 5-10 minutes over medium heat until the Tomatoes become soft and the Potatoes are cooked through. 5/ Include the Spring Onions to the pan cook for 1-2 minutes until they wilt. 6/ Just a minute before removing the dish from the fire, sprinkle the dried Basil, toss for a minute, season with Salt if needed. you can squeeze a bit of lime if you want to. 7/ Serve over a bowl of rice or as a side-dish to any meat you like. 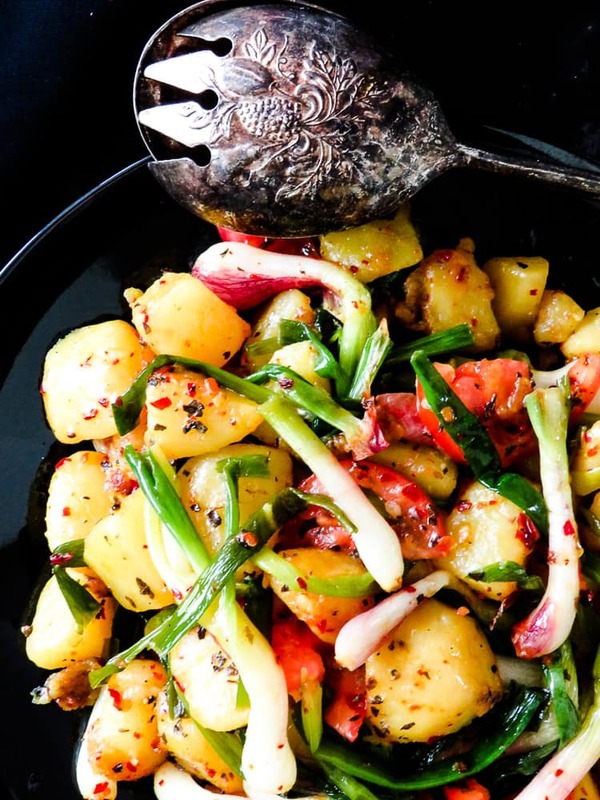 For more recipes like this Potato, spring Onion Basil chilli stir-fry. Please subscribe to the blog by adding your email address in the subscribe box and you will get all the recipes I publish straight into your email. You can also find me on Facebook, Twitter, Instagram and Pinterest.